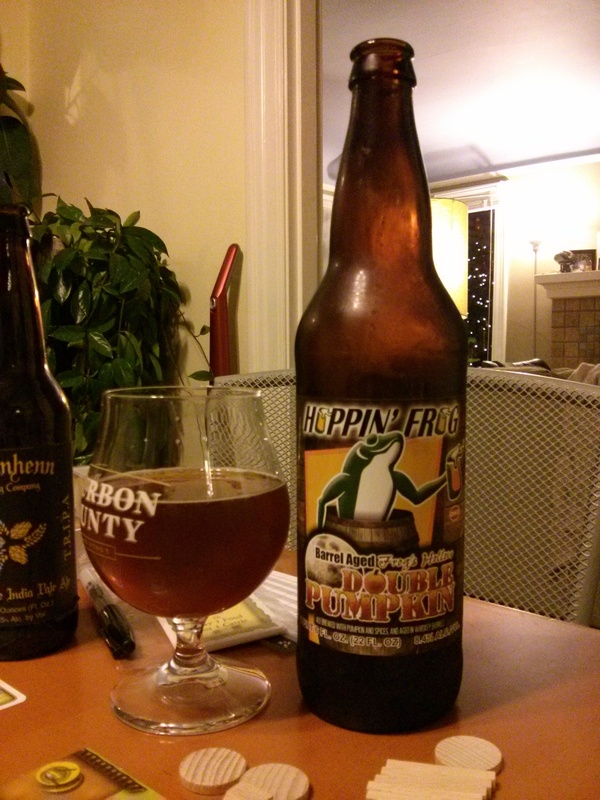 Hoppin’ Frog Brewing’s Frog’s Hollow Double Pumpkin Ale is a seasonal beer made in Akron, Ohio. The brewery has limited distribution which is mainly on the East Coast and some in the Mid-West. Poured a slight hazy burnt orange color, similar to most pumpkin ales. There was little to no head when poured and small head that did pour quickly dissipated. Frog’s Hollow has a very strong pumpkin spice aroma to it, just smelling the beer brings you to a blustery November day filled with family members and pumpkin pies baking in the oven. The aroma is full of cinnamon, ginger, nutmeg, pumpkin, along with some oak and alcoholic notes. The first sip of this beer is very pumpkin-forward, it also has strong whiskey flavor to it but is not over-powering. There is not very much carbonation to this beer, something that could boost the tasting experience a bit. There is not much of a hop presence in this beer, which makes sense when you see that the IBU rating is only at 7.3. The beer was quite thin in texture, with the ingredients and whiskey barrel aging I was expecting a more complex mouthfeel.